The growing conditions should be a primary concern; invest the appropriate time into planning how to properly space out the flower beds, since plants and flowers will grow bigger over time. 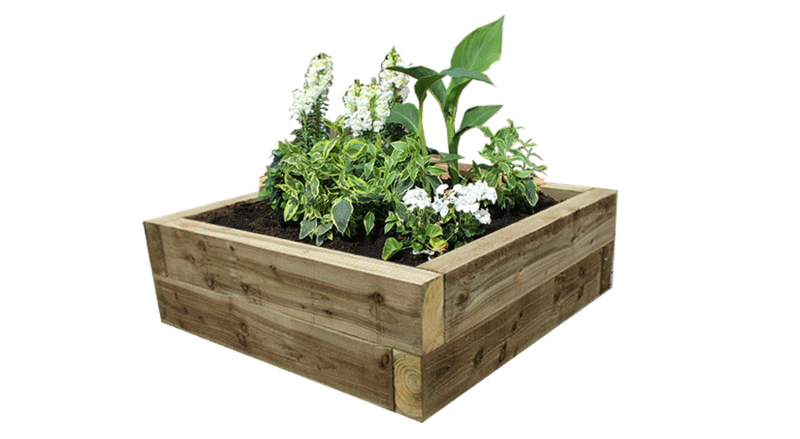 Overcrowding can detract from the overall aesthetics of your garden. Top grade railway sleepers can help to protect your raised beds; our cheap, yet effective railway sleepers can last as long as 12 years - they can also be used for different applications such as cladding, fencing, furniture making, etc. Your garden should embrace all four seasons – winter, spring, summer and autumn. A carefully thought out scheme will assure horticultural success throughout the year. Maintaining overall continuity and coordination can help to achieve a harmonious and effortlessly rejuvenating ambiance; ensure that the exterior of your home complements the interior to create an even balance. A place where you can unwind and find relaxation, your garden also allows you to soak up the fresh air and enjoy some of nature’s many splendours. By keeping your furniture and additional decorations as simple as possible, the main focus will remain on the planting. The right choice of colours is integral to the overall landscaping project. With many different planting techniques to choose from, try to envisage your flowers in bloom and carefully select the colours that best demonstrate your chosen theme. A minimalistic look can be achieved by keeping the colour pallet simple; perhaps varying the shades from dark to light. For a more English country garden effect, bright colours and tall stems will promise an abundance of colour and a fragrant bouquet. Railway Sleepers offers a wide variety of products for all your landscaping and gardening needs! Contact us today at sales@railwaysleeper.co.uk or write to us here.